All of ITT employees in Australia use dashboards Mike built for us. I now know the pulse of my business at all times. I can’t live without them. At NFORM we produce responsive business intelligence solutions that provide immediate insights. We create interactive dashboards that eliminate the hours or even days of cutting, pasting and pivoting data in spreadsheets. 95% of organisations do not require expensive, big data warehouse solutions. Utilising cost effect software solutions, NFORM will build you dashboards and reports that you can begin testing in as little as one day. We often suggest to our customers that they start small. Build the core elements into dashboards and then add functionality as you use the tools and see the capabilities. The NFORM approach ensures that if you do need to move to a big data solution, the upgrade path exists. We will take your “nasty data” and turn in into a format that is usable for your application in a timely manner. The number of self-service business intelligence software packages on the market seems to be growing daily. With such a selection it can be difficult to choose the solution that will be best for your business. If you find yourself in this situation, give us a call and let us listen to your requirements and then talk you through the selection process. 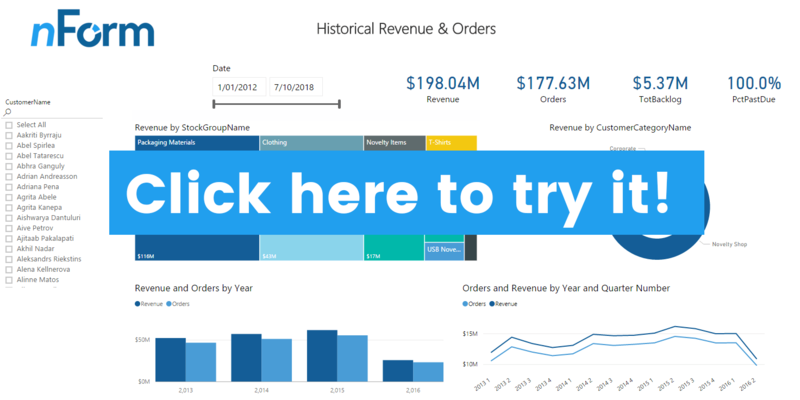 You can also read our comparison of two of the most popular solutions on the market Microsoft Power BI and Qlik Sense. Why hire NFORM for Business Intelligence? BI projects typically become drawn out and expensive due to the disconnect in communication between business users and IT professionals. We have eliminated that gap. Our consultants come from business roles while still having the expertise to built business intelligence solutions quickly. Try our interactive sample report! Rather than read about it, we suggest you try it. We built a fully working interactive report that you can test yourself on our site. Click the image to try it for free.